This is probably the best chocolate chocolate chip cookie recipe that you will ever meet-rich, decadent, and down right sinful, these are a favorite in my house. Make sure to use the best quality chocolate you can find, it makes all the difference in the world! I especially would love these at a barbecue with a scoop of vanilla ice cream. 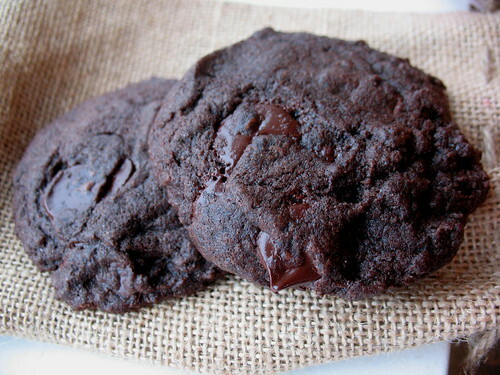 Don't bake these if you have an extreme love for chocolate, you won't be able to resist them. If you are making them for small children, they are delicious with dark chocolate M&Ms substituted for the chocolate chips. Pre heat your oven to 300 F and line your baking sheets with parchment paper. In a medium sized bowl, whisk together the flour, baking soda, salt, and cocoa powder. Set aside. In a large bowl, beat the butter and sugars together until they form a paste. Scrape down the sides of the bowl and then continue to beat, adding the eggs one at a time and the vanilla extract. Mix until light and fluffy. On low speed, add the flour mixture until just combined. Stir in the chocolate chips with a wooden spoon. Spoon out the dough by tablespoons onto the cookie sheets, shaping slightly with your fingers so they are round. Bake about 21-23 minutes until the tops are just set, and then transfer to a baking rack to cool completely. Makes about 2 ½ dozen.